So that’s it for Roger Moore. He had a good run, but after how old he looked in A View to a Kill, I’m just glad he didn’t come back for another one. 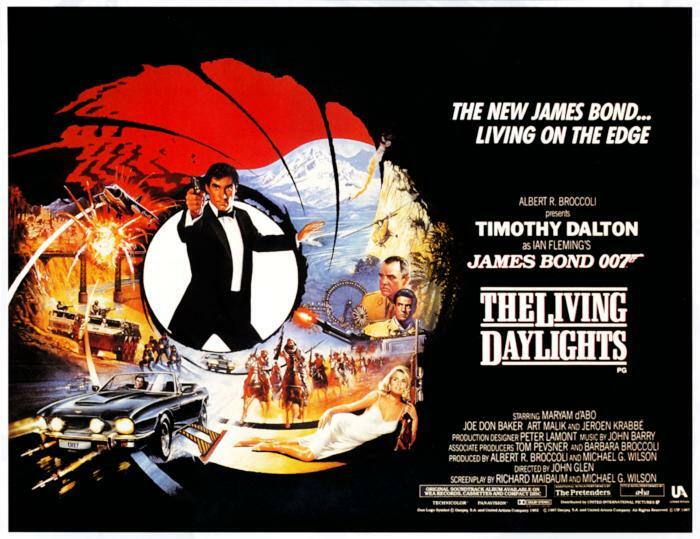 The Living Daylights is a great film, with a brilliant Bond at the helm, here are my thoughts. First up; the new Bond, The job this time goes to Timothy Dalton. He definitely looks the part, and it’s nice to see an actor who you can believe could do the things on-screen. He’s much more sinister than Moore, you believe this guy would kill you without a second thought. But he’s still suave in his own brash, angry sort of way. Some how. He’s also huge departure from Roger Moore in terms of tone. Gone are the (majority of the) quips that made Roger Moore his own Bond. Instead, Timothy Dalton is a lot more serious than previous Bond’s and a lot of the absurdity of previous films is gone as well. The film is much more grounded in reality and Dalton’s almost grumpy Bond is a much better fit than any previous Bond. The plot goes from assassinations, to corrupt arms dealers, to opium. Sadly, this means most of the humour is gone from this film, it’s a darker film than others, much more focused on realism rather than moving Bond from one set piece to the next. Although that does not mean that this film doesn’t have any breathtaking action sequences. The pre-credits scene see’s Bond racing down The Rock of Gibraltar on the back of a Land Rover Defender. It’s a great scene and an even better introduction to the new Bond. The ending of the film remains for me as one of the all time classic Bond action sequences. Bond has ended up in Afghanistan (in the midst of the Soviet War there) and this itself is a much less glamorous place than a lot of other Bond locations. As well as an awesome firefight on an airbase between the USSR and the Mujahideen, the end sequence see’s Bond and Bond girl Kara escape in a Soviet cargo plane only for Bond to end up in a mid-air fight whilst hanging out of the plane, holding on to the cargo of opium. This scene is iconic to me at least and I remember reenacting it loads of times, like countless other Bond action sequences. In fact I think I have a soft spot for this movie especially, it’s just brilliant. The Bond girl in this film is an odd one. Played by Maryam d’Abo, she’s not the usual Bond girl, she’s a talented cello player and is actually integral to the plot. She can look after herself and is a far cry from Stacey Sutton from A View to a Kill. If I had to pick a weak thing in this movie, I would say the villains. The chief villain is Georgi Koskov played by Jeroen Krabbé. He’s still good, and is fun to watch, but he isn’t a match for Bond. Another villain is the evil weapons dealer Brad Whitaker played by Joe Don Baker. He’s better and his war room where he keeps all of his fancy toys and weapons is just awesome. But the real baddie worth mentioning is the evil Necros. He’s the henchman of this movie, in the vein of Jaws or Gobinda. Played by Andreas Wisniewski, he’s really threatening. Whether he’s throwing explosive milk bottles, strangling someone with headphones or killing agents with automatic doors, he’s just a cool bad guy. And Bond kills him in a surprisingly cold-hearted and ruthless way. This movie is GREAT! I love it, and I have loved it since as long as I can remember. If you’ll like it probably depends heavily on your feelings for Timothy Dalton. He plays it straight, but this movie is not as serious as License to Kill (which I also love and is coming up next). I think Timothy Dalton is actually one of my favorite Bonds, and it’s a shame some critics didn’t like his humourless take on the role because that’s just what Daniel Craig is famous for. I really wish he’d gotten more than two films, I think he’s really good. Sadly it seems he was ahead of his time, but he’s lucky. Because this is the Bond series, so he’ll never be a bigger punchline than George Lazenby.